To follow a healthy balanced diet we need a range of macro and micro nutrients. And sometimes we can get these from the most surprising sources. Take bread. If you blindly believe what you read in the press you might consider bread a worthless filler, offering no nutritional value to your diet. However, this simply isn’t the case. Bread provides our body with so many essential vitamins and minerals it is no wonder it has been the mainstay of the British diet for generations. But recently bread seems to have fallen out of favour, and we have forgotten the huge contribution it makes to helping our children grow and to keeping us fit, active and healthy. It is time to once again celebrate bread for the health food that it is. Too long have we erroneously shunned it for pricier, harder to source, less tasty alternatives. Let’s put bread right back where it belongs: on our shopping lists and in our tummies. Bread loving Georgia Kousoulou, from TV’s reality show The Only Way is Essex, wants to do just that. She has recently launched the Powered by Bread range of activewear designed to highlight that bread is a perfect workout partner. It is a great source of carbohydrates, providing the fuel needed for everyday life, and especially for exercise. 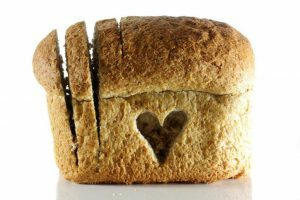 Bread is low fat, low in sugar and high in fibre, plus it’s one of the easiest carb sources to include in your diet as the preparation time is minimal. To be in with a chance of winning a set of Georgia’s Powered By Bread range follow the @WeHeartBread channels on Twitter and Instagram and look out for details of the upcoming prize draws.